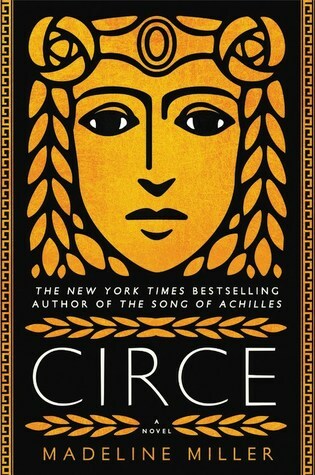 Circe by Madeline Miller. Little, Brown and Company, 2018. Hardcover. 400 pages. It might only be April, but Circe has already fixed itself a place as one of my favorite books of 2018. I actually read Circe back in January, but my feelings for this book have remained strong and I still love this book as much as I did when I first read it. I wrote most of this review back in January when the book was still fresh, but I've been adding to it since then and I find that there is always more that I want to say about it. I've always been interested in Circe as a mythological figure, but there's surprisingly/relatively little in the world of fiction focused solely on Circe and her own story. Miller's story is a retelling that I didn't realize how much or how desperately I needed it, and I just desperately want to tell everyone to read it. Crice reads sort of like a literary historical fantasy. Miller's prose is stunning and reads almost like a song. I have heard endless people praise her previous book, The Song of Achilles (which I still have yet to read), for ages, and now, reading Circe, I can understand why. There is something exceptionally magical and effortless about the way in which Miller narrates this story, and I imagine all of her writing is a gorgeous as it was in this book. Every word she writes is both subtle and powerful at the same time, which makes this book one that is hard to put down and even harder to get out of your head. I think what I loved the most about this story was how Miller stuck so faithfully to the major plot points and events that occur in the myths of Circe's life. She doesn't make any extensive changes or alter her entire life; instead, Miller merely fleshes out these stories and adds much ore context and life to them. Circe became incredibly relatable and someone whose life I truly became invested in. In addition, Miller included all of the characters that Circe interacts with in the many previous stories about her, including Odysseus, her sister (Pasiphaë), her brother (Perses), Penelope, and so many more characters that contribute so much depth and intrigue to this story. Despite the impact that many of these character's have on Circe's life -- both positive and negative--the story never fails to focus solely on Circe and center in on her turbulent life. The Circe that Miller has created for this book is a remarkable woman, flawed but also remarkably wise and able to adapt to whatever world she is in. My favorite aspect of Circe was her continuous development as a person. In particular, I loved watching how she grew up as a child who never quite fit in or received the respect she desired and became bitter and angry as a result, and how slowly but surely she developed a keen knowledge that guided her throughout her life. Circe has many weaknesses, but she develops many strengths in response to these while also learning how to work with her anger rather than against it and use it for better purposes. I felt so connected to Circe's character, more so than I have to any character in a while. I think I also read Circe at a wonderful point in my life (or not so wonderful, depending on how you look at it) because I was personally experiencing many of the same feelings, revelations, despair that Circe experienced, and I feel she helped me discover how to make it on my own journey. I felt as if I grew myself, and I felt incredibly empowered by this book. I think any woman that reads this book will be able to walk away from it with their own sense of empowerment, in whatever form it may take, and I also think that any person could find something in this book to take away with them. As beautiful as this book is, it isn't a particularly nice book. There is death, anger, violence, despair, loss, heartbreak, love--there's everything you do and do not want in your life, but there is plenty more negative than there is positive. This is a book that doesn't necessarily make you feel happy, but it leaves you pondering Circe's life and how things happen in one's life, whether they want it to or not. In addition to the lives of the characters, Circe also contains some beautiful settings and descriptions of the world in which Circe lives. I was so caught up in the descriptions of the island on which she lives, of the large ocean and the deadly monster that lives there, of the palace that she grew up on, and so many more places. This book will absolutely transport you to mythological Ancient Greece. Overall, I've given Circe five stars and I can't recommend it enough!